Internet giant Microsoft may soon be a player in the social domain. First spotted by fusible.com, going to socl.com reveals a landing page for a new social networking site where users can log in with their Facebook or Twitter accounts. As of now, logging on to the site displays a message that reads, "Thanks for stopping by. 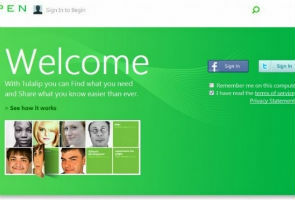 Socl.com is an internal design project from a team in Microsoft Research, which was mistakenly published to the web. We didn't mean to, honest." The service supposedly called "Tulalip" sounds like a real tongue twister but sounds catchy at the same time. How Microsoft plans to makes its name in the social networking circle still remains to be seen. The fact that you can log in with your Facebook or Twitter account eliminates the need for you to have a separate login account all together. As of today, Microsoft's gaming hardware, the XBOX 360 is a market leader when it comes to social networking on gaming consoles with Twitter and Facebook integration on the consoles XBOX Live service. Facebook is still the largest social networking group with over 750 million subscribers. Google Plus recently launched by the search giant already has an install base of over 10 million users.